The presence of gas in a reservoir often produces a detectable suite of responses in the seismic record; and it is obviously very important for the interpreter to be able to recognize these gas effects. 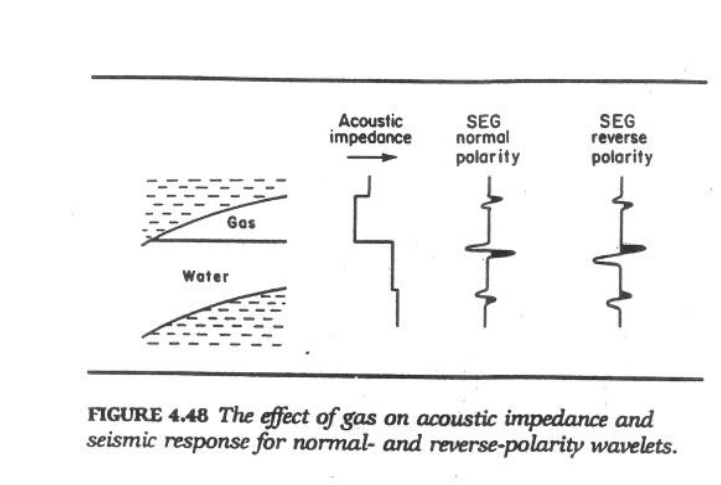 The way in which a reservoir responds to the presence of gas depends on the acoustic impedance of the gas-filled portion of the reservoir, the water-filled reservoir, and the cap rock; and the thickness of the gas-filled interval. If the gas column is thick enough and there is an acoustic-impedance contrast between the gas-/oil or the gas-/water filled portions of a reservoir, a reflection commonly called a flat spot will result. As a rule of thumb, flat spots are likely to be found in porous sandstones or carbonates down to about 2.5 km. Below this depth the effect of gas on velocity is less marked and the chance of getting a good reflection from a gas contrast is reduced. Flat spots will always have a positive reflection coefficients, appearing as a trough on seismic sections displayed with SEG normal polarity or a peak on reverse polarity sections. Although gas contacts are usually horizontal in depth, they do not always appear horizontally in time due to the push-down effect of the lower velocity in the gas interval. Dim spots due to a reduced reflection coefficient of the top-reservoir reflector are more common with less porous or well-compacted sands and carbonate reservoirs. The carbonate would usually have strong positive reflection coefficient. Gas in the reservoir reduces the reflection coefficient, causing the top-reservoir reflector to lose amplitude and dim. Amplitude anomalies are sometimes accompanied by corresponding polarity changes. A polarity reversal of the top-reservoir reflector at the gas-oil or gas-water contact is a common feature of bright spots. If the gas column is sufficiently thick, a push-down may be observed on underlying reflectors. Diffractions are developed where there is a significant lateral contrast in acoustic impedance and are often seen at the edges of bright spots. "Gas chimneys" or "gas cloud' -poor data zones above gas-bearing structure are quite common and can be very characteristics. 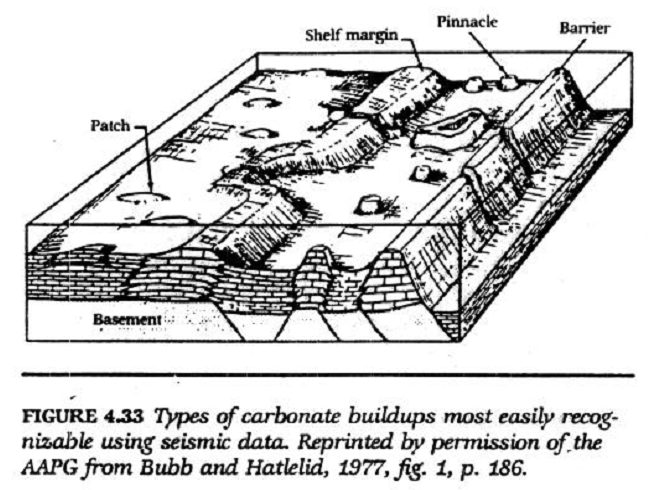 Poor data zones are thought to be caused by scattering of seismic energy by escaped gas penetrating the cap rock above a gas reservoir. Gas leakage into the cap rock can occur through a variety of mechanisms (leakage along fault planes; fractures; or overpressure exceeding the mechanical strength of seal rocks. Regardless of the mechanism responsible for salt movement, flow of salt into a growing structure creates a withdrawal basin that is a structural low and an isopach thick. Pillow stage : Syndepositional thnning of sediments over the pillow crests and flanks , developed in response to pillow growth, is the most diagnostic feature of this stage. Only minor thickening usually develops into the primary rim syncline. Diapir stage : Withdrawal of the salt into the growing diapir leads to a collapse of the flanking sequence that thinned toward the original pillow. A secondary rim syncline, its axis immediately adjacent to the diapirs's edge, develops above the collapsed area. The secondary rim syncline is usually more extensive than primary rim syncline and also accumulates a thicker sequence. Postdiapir stage: During this stage, diapirs stay at or near the sediment surface (assuming there is sufficient salt for continued movement) despite continued subsidence. A small, often subtle , tertiary rim syncline flanks the diapir. Salt and associated evaporites are quite common in many sedimentary sequences. Salt has a low density (2.2 gm/cm3), lower than that of most other commonly occuring sediments. When deposited in sufficiently thick layers, it becomes inherently unstable if it is buried; and a density inversion between the overburden and salt is achieved. In such circumstances, salt flowage is initiated and passes through threee widely recognized stages of pillowing, diapirism, and postdiaprism. Bishop (1978) discusses the complex interaction between depositional history of the surrounding sediments and growth of salt structure. Controversy surrounds the question of whether the dominant processes in development of a salt diapir involve intrusion or extrusion of the salt. Normally, reflections from the top boundary of a carbonate unit have a large positive reflection coefficient because carbonates usually have high velocity and density compared to other common sedimentary rocks. Only in cases where the carbonates are very porous or fractured are reflection coefficients of upper boundaries likely to be negative. The usually high interval velocity introduces a potential resolution problem. Not only do thick sequences appear thin in time on seismic sections due to high velocities but the minimum thickness required for adequate vertical resolution can be quite high. Interval velocities between 4500 and 6000 m/s are common for older carbonate units. A carbonate 100 m thick, with an interval velocity of 5500 m/s, would be represented by only 36 ms two-way time. Alternatively, for a seismic frequency of 25 Hz and interval velocity of 5500 m/s, the half wavelength thickness for no interference between reflections from top and base is 110m and the quarter wavelength tuning thickness is 55 m.
sheet-like deposits : These are often extremely extensive laterally and consist of fine-grained carbonate particles or calcareous microfossils deposited from suspension (e.g, , micritic limestones, chalk, calcareous claystone, etc). These deposits show characteristics similiar to those of other fine-grained deposits but can usually be recognized by their high amplitudes, good continuity, and if thick enough -by high interval velocities, which are rarely less than 3500 ms/s. Mistaking volcanic ash or tuff beds for carbonates is a potential interpretation pitfall. Tuff beds have high interval velocities and are laterally extensive, producing a seismic response similiar to that of bedded carbonates. Bioclastic deposits : Consisting of sand-sized carbonate grains transported and deposited by high-energy currents, these will have the same form and depositional setting as other noncarbonate clastics. Bioclastics may possibly be identified by their expected higher interval velocity and higher reflection amplitudes. Other considerations, such as the paleogeography and other recognizable associated lithlogies may aid an identification. In many cases, however, it may be impossible to differentiate between bioclastics and noncarbonate clastics. Buildups, reefs, bioherms, banks, mounds, etc. This type of deposit has a large biological element comprising the skeletal remains of living organism. These deposits are usually characterized by shape and high interval velocity. Barrier buildups, tending to be linear with relatively deep water on both sides during deposition. Pinnacle buildups-roughly equidimensional features surrounded by deep water during deposition. Shelf margin buildups- linear features with water on one side and shallow water on the other. Patch buildups-usually formed in shallow water, eiter in close proximity to shelf margins, or over broad, shallow seas. Reference : Michael E. Badley, Practical Seismic Interpretation.